At the core of Redbubble improving revenue is a constant drive to improve the user experience of their website. This in turn improves conversion rates which has a dramatic effect on revenue making every marketing channel more profitable without increasing ad spend or traffic. Redbubble’s focus on improving conversion rates is continuing to show positive returns. One way Redbubble plans to improve their user experience this year is by focusing on improving their search algorithm. They currently have over 10 million images which can be used on 60+ different products from over 438,000 artists so ensuring customers can get to the right images & products in the least number of clicks is key to maximising conversion rates. Along with fine tuning the algorithm, the layout of search results are being constantly split tested and improved with changes such as showing the artists image on a product as opposed to just showing the artists image improving conversion rates significantly. 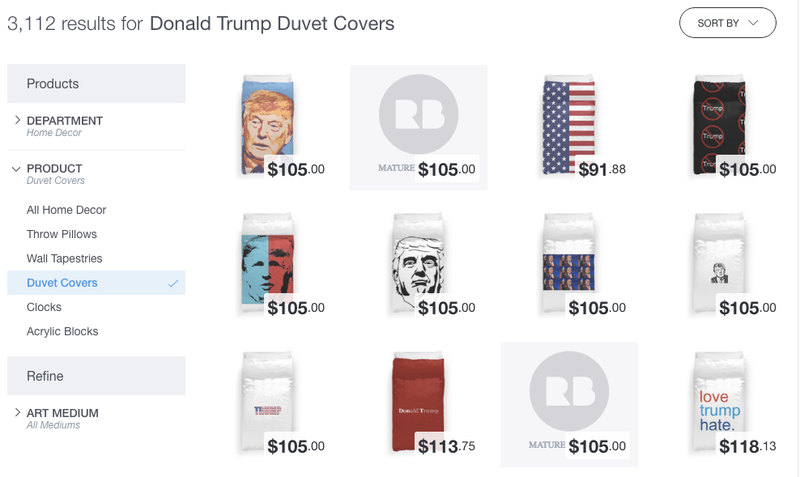 With over 10 million images even niche searches such as ‘Donald Trump duvet covers’ have a large number of results that need to be optimised. 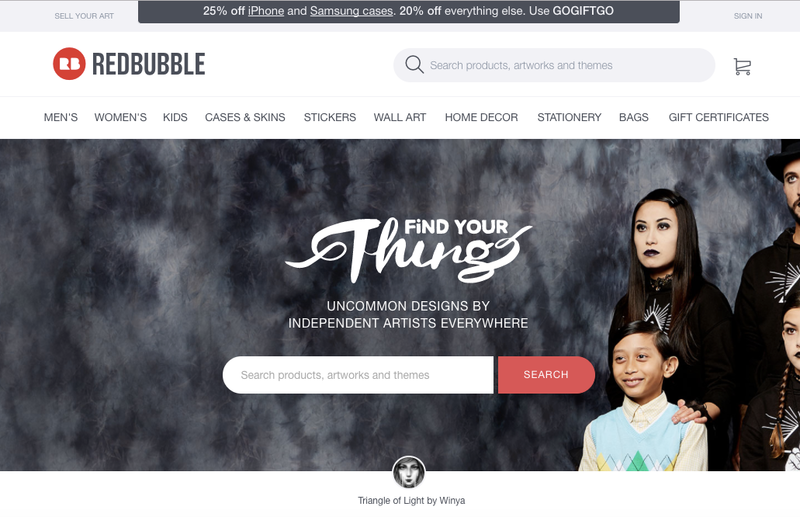 In line with global trends, Redbubble experienced a 71% growth in mobile visitors to the website, compared to just 28% growth in desktop users. However the conversion rate on mobile was just 1.18% last financial year, compared to 2.52% on desktop, leaving a lot of opportunity even when cross device conversions are taken into account (where a user browses on a mobile device but converts on desktop later). To take advantage of this opportunity, Redbubble intend to focus on improving their mobile experience, making it easier to transact across all devices. 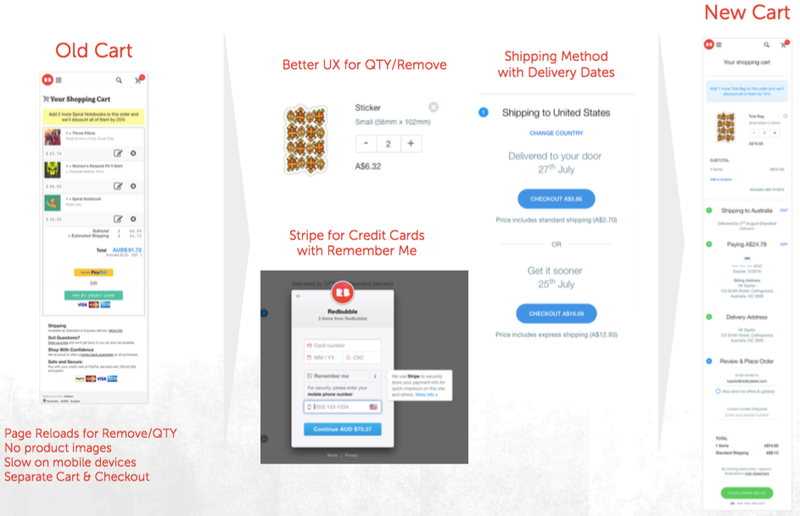 Mobile improvements to the responsive website that are now in place or currently underway include an updated shopping cart, one-page checkout, upgrading from off-site Paypal card processing to on-site Stripe payment processing and personalising the delivery date information so customers can see exactly when to expect their order delivery. Redbubble’s new & improved shopping cart & checkout process for mobile devices. To further improve the experience for mobile users and improve repeat purchasers in particular, Redbubble are also working on a mobile iOS app which will make it faster for people to find the artwork and product they are looking for and will further enrich the mobile experience for their customers, along with opening up a new marketing channel to drive new customers. The third major focus for this year is personalisation. Essentially, learning about users (and groups of users) and then serving the most relevant products to every unique visitor to the site. This not only helps with repeat purchases but can improve conversion rates for users requiring multiple visits to the website before converting. Redbubble have started by implementing a new personalised homepage which shows each user a unique set of products based on previously viewed and purchased products. This personalised homepage has outperformed the generic version and now the changes are being rolled out site wide across categories and search results and they are also now planning to personalise their email marketing. Along with those three major focuses, the company plans to continue conducting user testing and analysis of both quantitative and qualitative data to make major and minor changes that continue evolving and improving the site and thus its conversion rate. Redbubble are very performance focused with their marketing and they plan to continue optimising their marketing channels this financial year to maximise both profitability and the volume of sales coming from each source. In the last financial year, free traffic sources such as organic search or email marketing made up 68.5% of their sales with paid traffic such as Google Adwords making up the remaining 38.5% with all of their paid sources profitable with just the initial purchase. The marketing channel breakdown of Redbubble’s sales last financial year. One of the main ways they plan to optimise their marketing this financial year is by utilising new, more targeted product feeds in Google Shopping. With millions of artists’ images available on 60+ products; creating, maintaining and optimising a product feed is a significant investment however Google Shopping is currently their most significant advertising channel and is one that offers the most scope for improvement due to its ability to automatically target very niche search terms. Over the past year Redbubble have completely re-built the way their platform interacts with Google and by doing so they are now able to push more content and images into the feed on a much more dynamic basis which is growing the volume of sales, whilst maintaining profitability. This financial year, I also expect Redbubble to utilise the same optimised product feed to launch a Bing Shopping campaign which has recently re-launched in Beta and offers a new source of sales with lower competition than on Google Shopping. 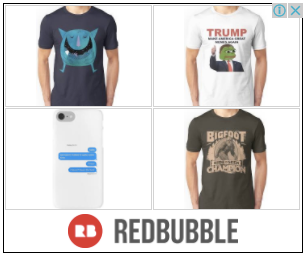 Redbubble’s products showing in a search that triggers Google Shopping ads. 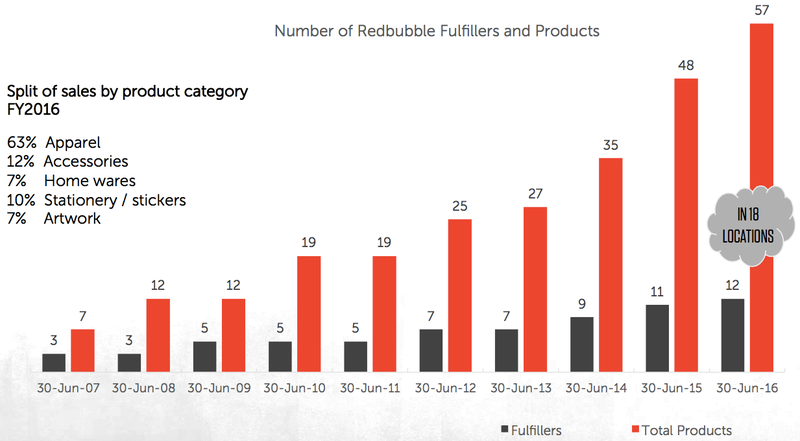 Another big focus for Redbubble is continued growth of repeat purchases which grew 76.04% last financial year and contributed a larger margin to the bottom line with most repeat visitors returning via free traffic sources such as direct or organic. 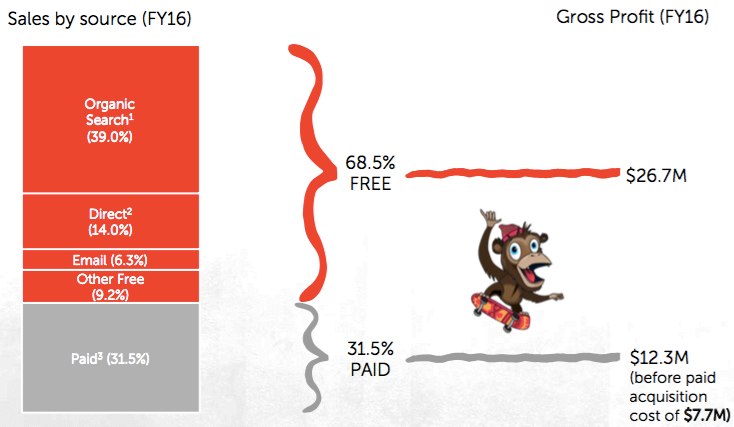 Redbubble’s strong growth in repeat purchases since FY13. They plan to keep growing repeat purchase in two ways. The first is through the use of more targeted and personalised email marketing (which surprisingly only generated 6.3% of sales last year) which they are setting up on a new, more powerful email platform. The second way they will continue growing repeat purchases is through remarketing on various networks including the use of dynamic remarketing. Dynamic remarketing uses the same product feed created and optimised for Google Shopping along with data on what products users viewed and later purchased to determine which products to market to potential customers – something that becomes more fine tuned over time as more data refines the model. 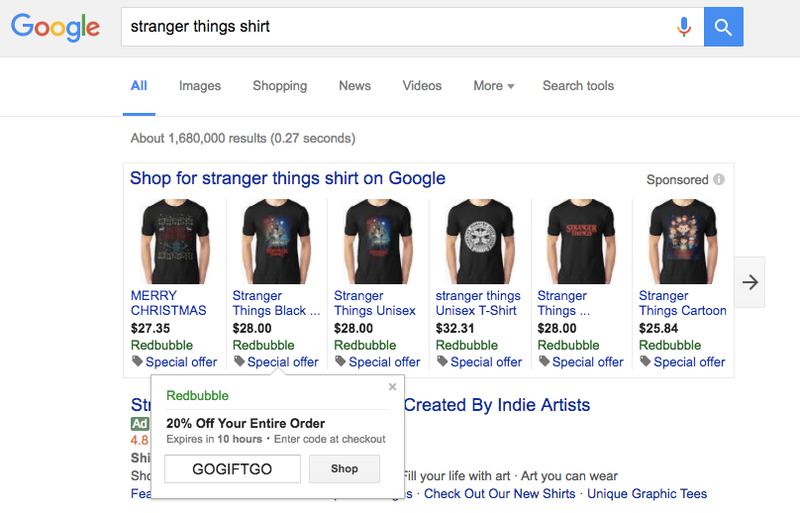 An example of Redbubble’s dynamic remarketing ads on Googles Display Network. Increasing the volume of sales generated from both paid and free social media sources is another major focus on Redbubbles agenda this year. With such large audiences on social media, the networks offers a lot of room for expansion given the relatively small ad budgets currently being spent. Paid social advertising, via Facebook in particular is beginning to drive a significant volume of profitable conversions for Redbubble since they first launched ad campaigns in 2014 so scaling these will be a key driver of revenue improvements. With their mobile conversion rates improving, social networks which operate predominantly on apps, such as Instagram will also offer opportunities for profitable paid social advertising, along with promotion of Redbubble’s planned new iOS app. 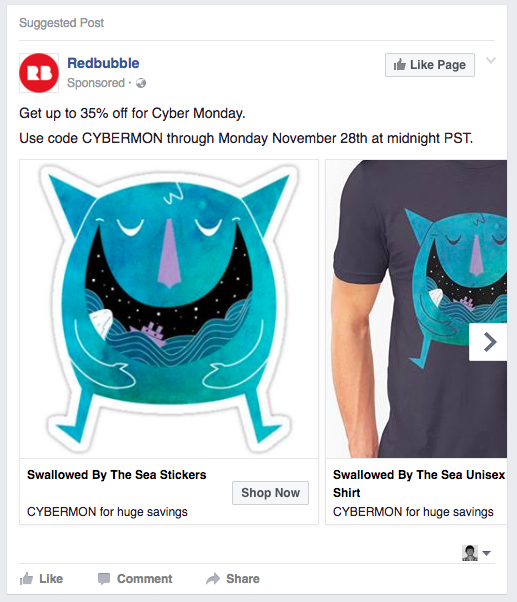 An example of some of the Redbubble’s dynamic remarketing ads on Facebooks Network. Increasing free or organic social traffic is also a priority for Redbubble. With image based products being created by a community of over 438,000 artists who are all financially motivated to promote their products, social is an ideal fit. To help the business grow, Redbubble will be working closely with artists and giving them the tools they need to easily share and promote products and content to their own followers to drive free social traffic to the website, generating sales for Redbubble and its artists. 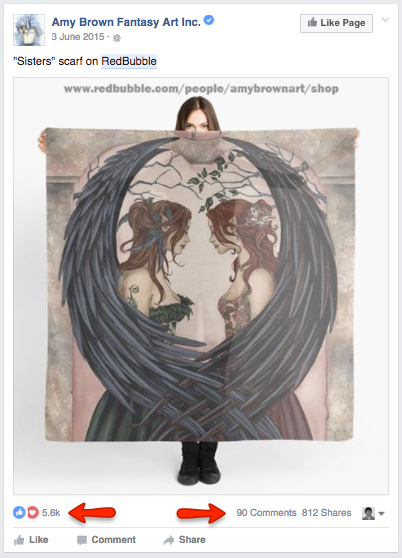 One of Redbubbles artists promoting her products with a lot of engagement and website traffic generated. With 39% of traffic being generated from organic traffic sources, Redbubble is reliant on Google and Bing’s search algorithms and rankings for a large part of their success. Along with optimising and improving their paid marketing channels a continued focus is improving their SEO rankings and increasing their organic traffic and sales. With 24.9 million pages from redbubble.com appearing on Google, onsite optimisation and ensuring the site is easily and effectively indexed and in-line with Google’s best practices is a major priority in their SEO efforts. Throughout the year they have many technical optimisations planned to improve rankings and traffic flow. Another way they plan to grow organic traffic is by continuing to increase the size of the website with ‘collections’ of products allowing creation of pages targeting high volume search terms such as “gift ideas” or “gifts for home”. They also plan to increase the number of artists listed on the website which will expand their (already huge) range of products, and allow them to dominate the rankings for niche searches such as ‘rainbow unicorn t-shirt’ and event driven searches such as ‘Donald Trump duvet cover’ as these artists add new artwork. Redbubbles collection pages which improve user experience and help organic rankings for new search terms. Another growth area for Redbubble is expanding their product range. Every time they make a new product available for printing they essentially add millions of new product options as most artworks can be adapted to fit the new product. Growing the product line, whilst ensuring fulfillers maintain the quality of the products they create is something that has contributed to their growth over the past ten years and will continue to be a key way they will grow revenue. Redbubbles product range has grown steadily since they launched the website and will continue to grow. 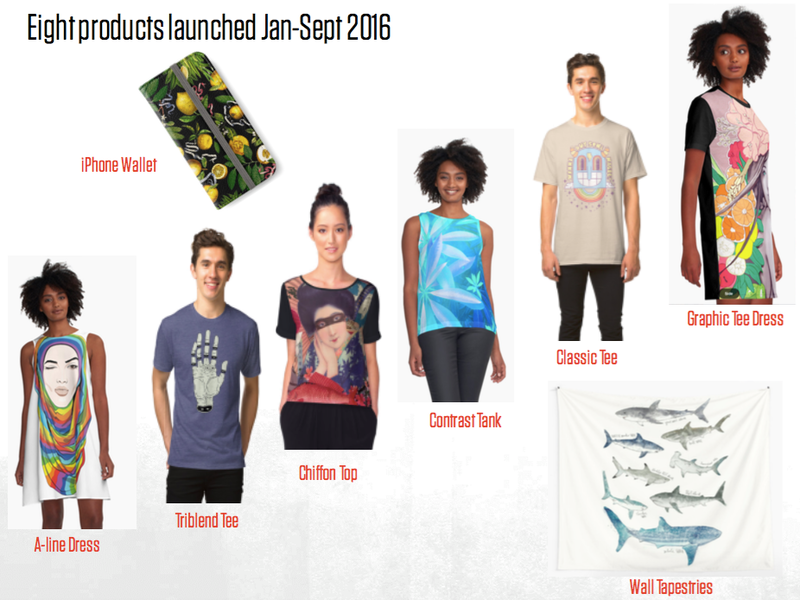 In 2016, Redbubble launched eight new products and in December in order to hit their ambitious revenue growth targets, they planned to launch at least 3 new physical products focusing on the home and gift giving category for the Christmas period. In 2017, I expect to see a lot of new products introduced inline with their past strategy and success. Eight new products that Redbubble launched last year. 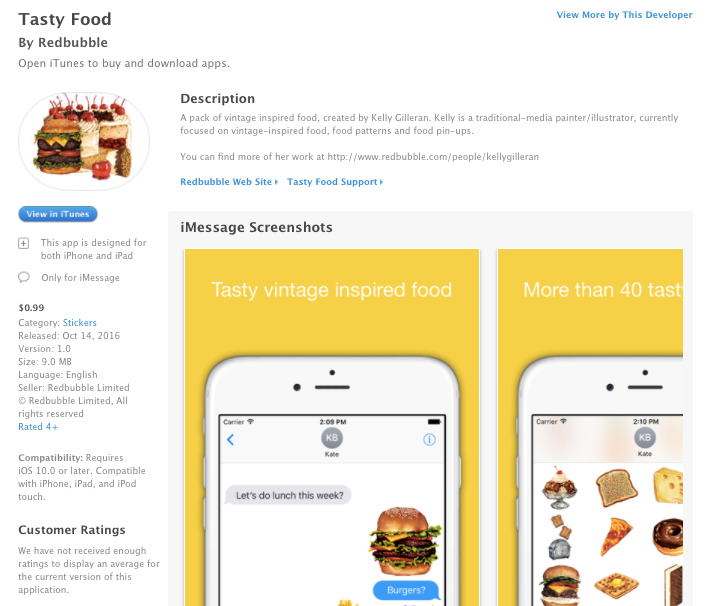 Another innovation which Redbubble are trialling is the launch of their first digital product – packs of “digital stickers” for use in Apple’s iMessage app and available for purchase in the Apple app store. These packs of stickers are priced from 99c-$1.49 and utilise existing artwork on Redbubble’s platform with each pack focused on just one artists work. There is certainly no guarantee these products will prove a big money maker but given the margins involved when selling digital products, it is one they will be exploring and developing over time along with other digital products. Redbubble’s top selling sticker pack for sale on the Apple app store for use in Apple iMessage. Redbubble have offered their products internationally since they started via 22 fulfillers around the world with products being sent by the nearest located fulfiller. However their website has always been in English. To continue growing their business they are now planning to expand their target market to speakers of other languages which started with a German site in March, French in June and Spanish in July. 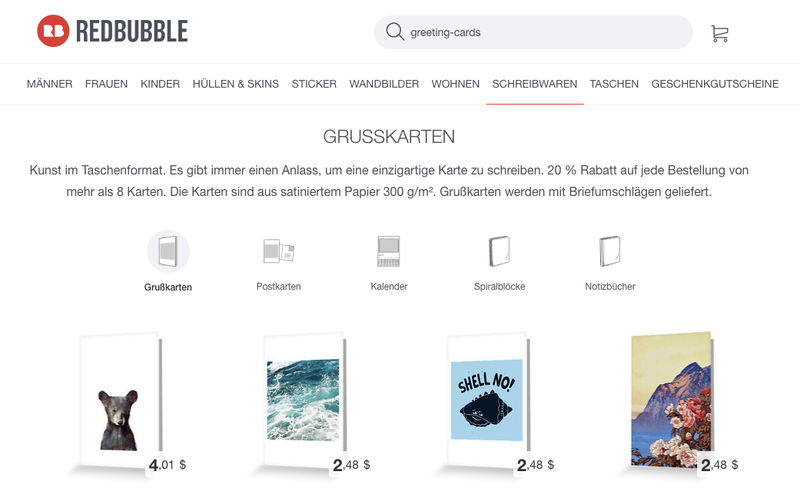 Redbubble’s new German version of their website which launched last March. Launching their website in new languages allows Redbubble to maximise the conversion rates of visitors that speak that language who now find the website easier to use and the experience of checking out easier. It also means that the 10 million artworks and 60+ product variations all have a page on the website in each language allowing Redbubble to rank for foreign search terms – improving organic traffic. The significant amount of work to launch these new websites is paying off with Germany now their fastest growing market, showing a large up-tick in performance since March last year. To ensure they continue growing a lot of time is being spent on improving the international sites, with artists now having the ability to improve their automatically generated translations for each product and marketing efforts underway to attract new foreign speaking artists to the platform to showcase their work. Local marketing efforts have also begun with paid marketing in German, French & Spanish and translated product feeds being integrated with Google Shopping to allow product ads on foreign searches. Going forward they plan to continue launching the website in new languages with a Chinese language site no doubt on the radar. Along with optimising and improving the website and marketing, and expanding product ranges and target markets, Redbubble continues to work on their business as a whole ensuring that they can continue scaling and growing. An example of this is the work they have done on transitioning their old, legacy IT platform to a scalable cloud infrastructure. This was a huge effort required to migrate the website and systems but this has meant the business is now ready to scale and grow globally – the added benefit being that the cloud infrastructure also has lowered costs. This move to the cloud has also helped the businesses drive to improve the speed of the website, especially at peak shopping times such as Christmas which leads to a better customer experience, increased search rankings and an improved website conversion rate. In line with the global growth of the business, Redbubble are also continuing to add fulfillment partners with three new partners in the US and Australia last year, and more planned in 2017. Adding localised fulfillment capabilities ensures shorter delivery times which improves website conversion rates and leads to a better customer experience, which in turn increases repeat purchases. 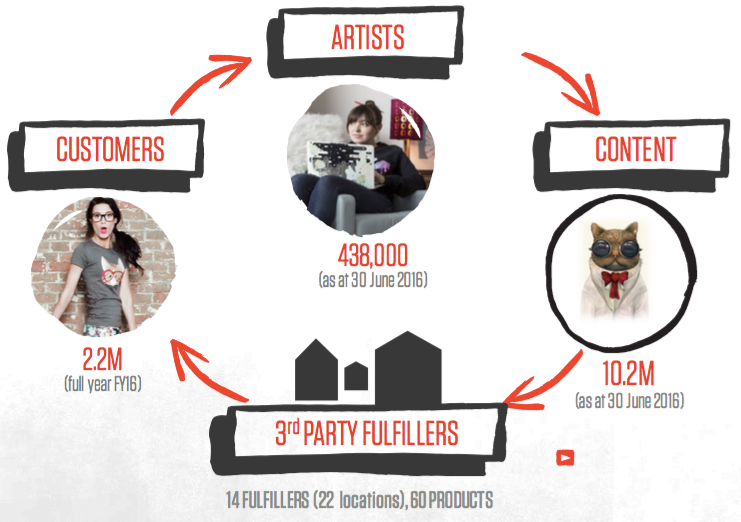 3rd party fulfillment partners are a key part of the Redbubble marketplace. With the growth in the business, Redbubble’s supply chain team are now in a position of strength so this year will focus on improving the margins by negotiating savings with third party fulfillment partners and shipping companies. Improving margins on Redbubbles products allows a larger spend on marketing with the same level of profit and thus the ability to grow sales volume, market share and ultimately revenue. 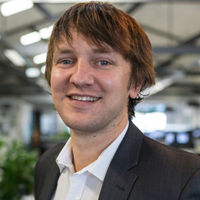 Redbubble are also focusing on minimising the cost of customer support which is a variable cost that has been growing in line with the business. To do this, they plan to outsource their customer support which will be more efficient but which will need to be monitored closely to ensure the customer support experience remains high to maximise repeat purchases. Last year was a busy year for Redbubble and the coming year looks no different with a range of activities in play to help the business grow significantly. Getting every element right will be key to hitting or exceeding their forecasts this financial year as well as using a fluid marketing approach to adjust their outputs and scale as they see success. As a ten year old “mature” eCommerce business the fact that there can still be so much going on proves there is always something more you can be doing online and there are always tweaks and optimisations you can make to your website, marketing or business that will have a positive effect. I look forward to watching Redbubble grow and seeing how they do in the future.